I have earlier commented on the acquisition of the head of Nefertiti from Amarna. The head was the main subject of a meeting of the Egyptian National Committee for the Return of Stolen Artifacts this week. Zahi Hawass notes that the session "discuss[ed] the procedures needed to make a formal request for the return of the Bust of Nefertiti now on display at the Neues Museum in Berlin". Earlier this month Dr. Seyfried met with Dr. Hawass and presented him with copies of all of the key documentation held by the Berlin Museum concerning this iconic piece. This includes the protocol of 20 January, 1913, written by Gustav Lefébvre, the official who signed the division of finds on behalf of the Egyptian Antiquities Service, and excerpts from the diary of Ludwig Borchardt, the excavator of the Bust. Egypt appears to be making a case that there was deliberate deception as part of the division of the finds. 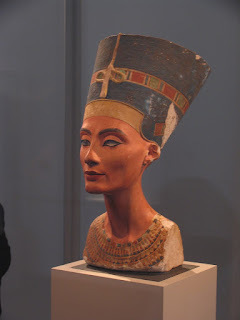 Nefertiti's bust is now in the refurbished Neues Museum in Berlin. I had the opportunity to visit it this year. It's in its own room and photography is not allowed, but I got a snap in while it was still in the Deutsches Museum during the "long night of the museums" (http://www.flickr.com/photos/cpjobling/2824787240/) in August 2008. If Nefertiti does go back to Egypt, there'll have to be some rethinking of the new museum! But when I went to the museum in summer 2009 I could photograph her as often as I wanted and many other visitors were also doing the same.